The newer Quinolone Antibiotics are considered 'safe' in most studies, and seem to have a low incidence of side effects. But this can be deceiving and the incidence of problems are often MUCH higher than the industry-sponsored drug trials say. Quinolone Antibiotics have an VERY DARK history, and many of the problems people experience are disabling long-term effects- and even death from these 'safe' drugs. post-marketing surveillance of several new quinolones." Notice that they said that these dangerous problems were found 'post-marketing'. This means that these reactions occur AFTER the drug is on the market and is being taken by YOU. What this says is that they KNOW that quinolone antibiotics are dangerous and have side effects that could be disabling or deadly and yet they keep developing new ones in the hope that THIS one won't have those problems. This is really NOT an exaggeration. There have been many quinolone antibiotics that have been shown to be safe enough to get FDA approval, yet once released into hospitals and doctor's offices, have been found to have such dangerous side effects that they were removed from the market. To Levaquin Tendonitis and Toxicity? Will the one that you are taking now be next? Once again, these were drugs that had already been approved for use and were BEING USED BY PEOPLE and had to be removed from further use because of dangerous side effects that were not discovered during the testing period of the drugs. In fact, new side effects, such as a Doubling of the Risk of Aortic Aneurysm, are being discovered regularly. are far fewer than they were in the older drugs- yet they continue to have unexpected disabling side effects such as Levaquin Tendonitis and Achilles Tendon Rupture that surprise the researchers- especially when the large number of Quinolone and Levaquin Drug Interactions, are taken into account. For instance, when these drugs are combined with Corticosteroid drugs like Prednisone given for inflammation. The interaction between Levaquin and Prednisone is EXTREMELY serious- yet the combination is given for even minor problems such as Levaquin Sinus Infection treatment- a minor problem that has and could end up leaving a previously healthy 20 year old an invalid with ruptured tendons and lifelong pain. tendon-related adverse events continue to be reported." So, what the FDA is saying, is that LABELING is not preventing these serious, potentially lifelong disabling side effects that they had already known about. But now they expect a STRONGER warning to prevent these quinolone side effects!? Remember, these tendon side effects can be disabling AND permanent in some people. Which people? Older people, those taking corticosteroids and those with tendon problems already are MOST at risk, but many people who have been affected had NONE of these problems- and some researchers even speculate that many people with Symptoms of Fibromyalgia may even be due to these drugs. If you are taking Quinolone Antibiotics for NON LIFE-THREATENING conditions like Urinary Tract Infections, Sinus Infections and Travelers Diarrhea- you should decide whether the possibility -however remote- of lifelong disability is worth it. Here is an up to date List of Quinolones, so you can avoid them. There is officially no CURE for the tendonitis and toxicity that occurs from the quinolone antibiotics, the authors of this website HAVE developed a Levaquin Tendonitis Solution that is the result of years of research and work with people suffering from this disabling problem. As you can see above, many of the quinolones were removed from the market due to toxic reactions to sunlight. Well, with one of the removed drugs, there were almost one thousand REPORTED reactions within the first 8 months after it was put on the market. These included second-degree burns, discoloration and sometimes permanent discoloration and scarring of the skin. While these problems occur ONLY when the person taking the antibiotics expose themselves to UV light (sunlight or tanning booths),and these antibiotics now DO have warnings on them about going into the sunlight- how many people read the arm's length list of warnings and side effects that comes in the package with these antibiotics? These skin problems don't stop there,though. In several animal studies, taking these antibiotics and getting exposure to UV light has resulting in a significant increase in skin cancer rates. 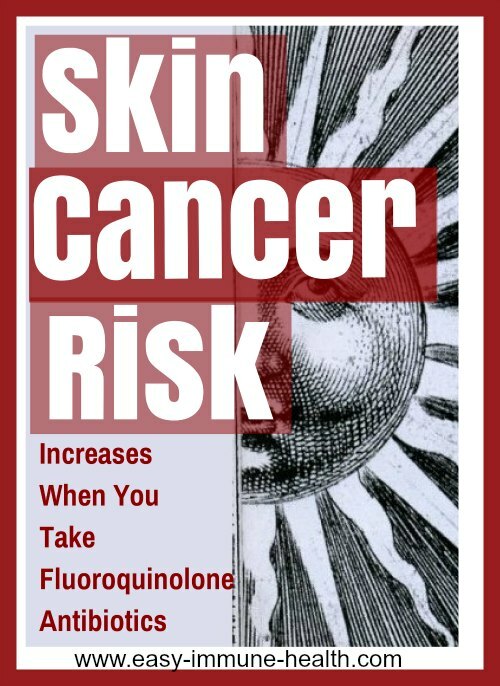 While increased skin cancer rates have not been found in human studies of quinolone antibiotics (yet), most human studies don't last for the decades that it may take to see the effects that a drug could have on the incidence of any type of cancer. 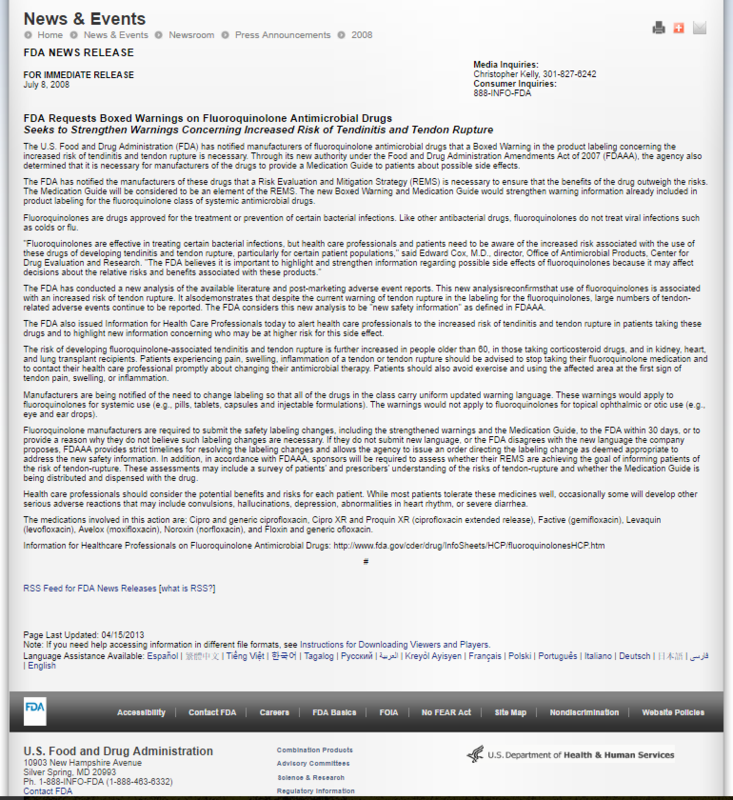 [fluoroquinolones] has yet to be determined." And to top it off, they are now developing TOPICAL quinolone antibiotic CREAMS for the use in cases of acne. Teens and young adults who use these creams are often the MOST likely populations to be sunbathing when given the chance. So, if having teens start using these drugs at a young age for skin conditions that last many years isn't a recipe for increasing skin cancer, then I don't know what is! Another not so great effect of Quinolone antibiotics is that they pull magnesium from the body. When you read the Signs of Magnesium Deficiency page, you'll see that magnesium deficiency is ALREADY a huge problem in western countries. While HUGE numbers of people are already suffering from undiagnosed magnesium deficiencies, these drugs pull even MORE magnesium from your body in a condition called Magnesium Depletion. And that at a time when you are already sick and using more magnesium! Some researchers hypothesize that those with depleted magnesium (which is most of us) are MOST at risk for some of the Neurologic Side Effects and Tendon Problems that are occurring with the quinolones. And indeed, there have been a few reports of resolution of these severe problems with the application of topical Transdermal Magnesium Gel that gets absorbed right through the skin. While Quinolone Antibiotics are generally considered 'Safe' by most researchers, with only a small percentage of people experiencing these problems, the researchers and the FDA have been WRONG about the safety of these drugs 9 different times!! And the people who DO experience these problems can have LIFELONG disabilities, chronic health problems and even increased risk of cancer and sudden death. The fact is that there have just simply been no long-term studies on this class of drugs that includes Cipro and Levaquin that they KNOW have caused major toxic problems to many different organs with a multitude of different formulations with no way of predicting who is going to suffer from these devastating problems. So the question is, are YOU willing to be the next one to be experimented on by taking these antibiotics. Cipro and Levaquin and Anxiety and Panic Attacks, Oh My!